Die-Pat bolt hole fitting, white polypropylene wheel. Light Industrial duty pressed steel bracket (zinc plated) with swivel head with double ball race. 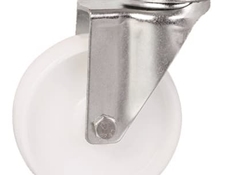 Wheels: White polypropylene and combined swivel and wheel brake. 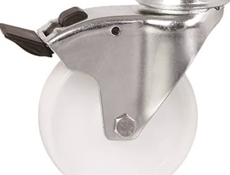 These light duty commercial castors are ideal for institutional catering applications.